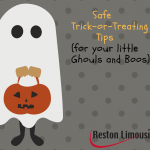 Whether you are booking a minibus or van terra from Reston Limo for your little ones to trick-or-treat in style or doing it the traditional way (on foot), the most important thing to parents when the ghouls and ghosts come out- is safety. Check out our handy tips below to keep your little monsters, princesses and superheroes safe while they collect their goodies on Halloween. Kids under 12 shouldn’t be alone at night without adult supervision. If kids are old enough to go out without an adult, it is best to go in a group and stick to familiar, well-lit areas. If your child is close to the age of trick-or-treating alone and is giving you a hard time about you going with them, try negotiating by offering to drive a few of their friends to the best houses and waiting in the car while they go to a few stops. This way you won’t be standing right behind them, potentially “embarrassing them” We know, they grow up so fast! Make sure your child isn’t walking from house to house with ear-buds in or looking down at their phone. We all do this, but it is especially important to see and hear their surroundings while walking at night. Add reflective tape or stickers to costumes which will make your child easier to see at night, you can even get creative and work it into the costume’s design! Masks can obstruct your child’s vision which isn’t a good bet when they need to cross streets at night, so choose face paint and makeup over masks whenever possible. Always send your child out with glow sticks or flashlights to help them see and be seen. Glow sticks are just plain cool, so it won’t be a struggle asking your child to tote a few! Be aware that Halloween is one of the most dangerous nights to drive; for everyone. Add parties and an increase in drunk drivers, with excited children dressed in dark colors and moving around in unpredictable ways, often running in to the street; so slow down by at least 10 miles an hour in residential neighborhoods and be extra alert. The most popular time to trick-or-treat is 5 – 9:30 p.m. so be especially alert during those hours. Take a few extra seconds to specifically look for children at intersections, on the grass or on the curb-keep in mind, they may be dressed in dark colors or dart out unexpectedly. Enter and exit driveways slowly and carefully as kids may be walking down or up to the door. Get rid of in-car distractions like loud music, eating or making hands free calls so you can concentrate on the road and keep an extra sharp eye out. We wish you all a Safe & Happy Halloween!